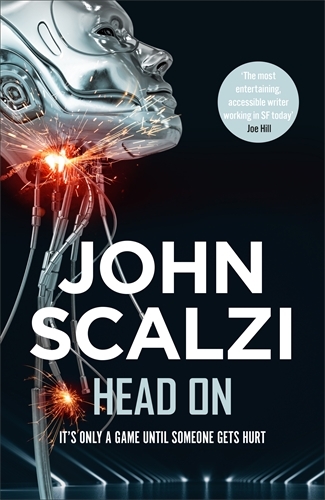 John Scalzi’s 2014 science fiction/crime mash up Lock-In posited a world in which survivors of a worldwide flu epidemic were struck with what is called Haden’s syndrome, in which they have fully functioning brains in bodies that do not otherwise function. To counter this disability, neural interfaces have been developed that allow Haden sufferers to interact with each other in a virtual space called the Agora and to get around using either android bodies, known colloquially as ‘threeps’ (think C3-PO), or through specially wired humans known as Intefacers. In Head On, the protagonist of Lock-In, famous Haden and FBI agent Chris Shane and his partner Agent Vann are back. This time they are investigating the first death during a game of the Haden-centric sport of Hilketa. In Hilketa specially designed threeps compete on field to rip off and score with the head of a randomly selected member of the opposing team. Shane and Vann’s investigation into the death of player Duane Chapman blows out from the original crime to take in corruption, money laundering, murky corporate shenanigans and Haden rights. As with the previous book, much of the plot is driven by the US Government’s previous disability support for Hadens and its decision to stop that support. Lock-In is worth catching up with in its own right, but despite the obvious connections Head On works fine as a standalone. Scalzi manages to bring his usual verve and humour to the plot, the characters and their interactions and has a deep understanding of the world he has built (a primer called Unlocked: An Oral History of Haden’s Syndrome is available online). And on top of a cracking crime fiction plot, Scalzi is also able to shine a light on the experience of the marginalised and disabled.